Child-friendly? Most children are likely to love little Despereaux, with his cute ears and charming bravery. But the plot is extremely complex for a kids’ movie – and so many characters are introduced throughout its 93 minutes – that the littlest viewers (and some bigger ones) may be confused. Any hint of violence is mainly that of a mild adventure movie, such as duels and imprisonment. 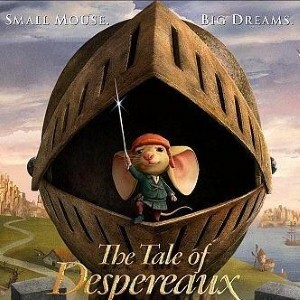 The Tale of Despereaux is an imaginative movie that was adapted from a similarly inventive series of children’s books by Kate DiCamillo. There are a number of tales that weave together, making the story anything but boring – but also a bit confusing. The story begins in a land called the Kingdom of Dor, in which people are soothed by a special soup cooked in the royal kitchen. However, everything changes when a rat named Roscuro falls into the queen’s soup, effectively killing her from shock, with the result that all rats and soup are banned forever. The story then moves to Mouseland, where we meet the adventurous Despereaux, whose bold actions get him banished to the underground purgatory of Ratworld. Throughout the film, the narratives are linked together by a belief in fairy tales – complete with castles, dragons and princesses. Fathers and children alike may be wowed by the animation, so rich with texture that you feel you could reach out and touch it. Because of its visual beauty, it may be easier to overlook the overly intricate plot and simply enjoy the fairy tale feeling.